Potato chips, meet nachos. Nachos, meet potato chips. With a topping of buffalo chicken and blue cheese dip, we’re all about to be the best of friends forever and ever. At first glance, this may look just like a mess o’ cheese and chicken and chips on a plate. Truth: It is. But that mess is also the most glorious combination of flavors and ingredients to ever grace the nachosphere ← which is totally a place, by the way, and one I like to go to often. And that combination I speak of includes crispy, thick and rustic BAKED potato chips, spicy and tangy shredded buffalo chicken, melty cheddar and blue cheeses, zesty green onions and a simple yet scrumptious blue cheese dip on the side slash drizzled — or dumped, as is my preference — allll over my plate of nacho heaven. I suggest you follow my lead on that one. Do not fret about the idea of making your own potato chips for this recipe, because the reality is they are supah-dupah easy to make. All you need is a food processor with a slicing attachment (a mandoline slicer works, too! ), a bunch of potatoes, an oven and a hankering for potato chips (hashtag story of my life). And perhaps, also, the promise that all of the work you put into this recipe (which isn’t even that much, trust) will be rewarded tenfold by one single bite of this savory pile of yums. I give you that promise, all the way over here in the nachosphere. On that note, head over to KitchenAid’s blog, The Kitchenthusiast for the recipe! And prepare thyself to get this mess o’ chips/chicken/cheese in your life ASAP. I love this! What a great idea. The whole gang here would go crazy over these. Pinned. Have a great day! I’m packing my bags and moving to the nacho-sphere! These look amazing. I want to face plant right into that plate! 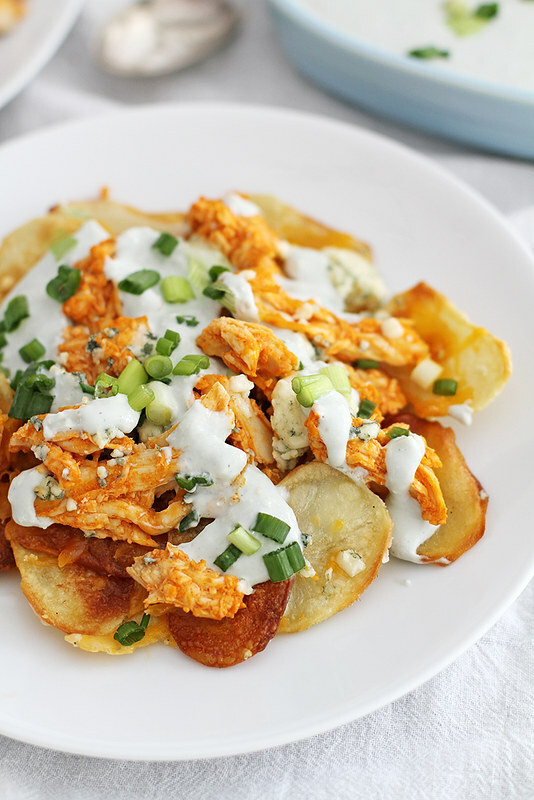 I want to live in your nacho-verse, where we bathe in buffalo sauce and use potato chips as flotation devices. YUM. Slingshot me into the nachosphere, I’m ready to gooooo! 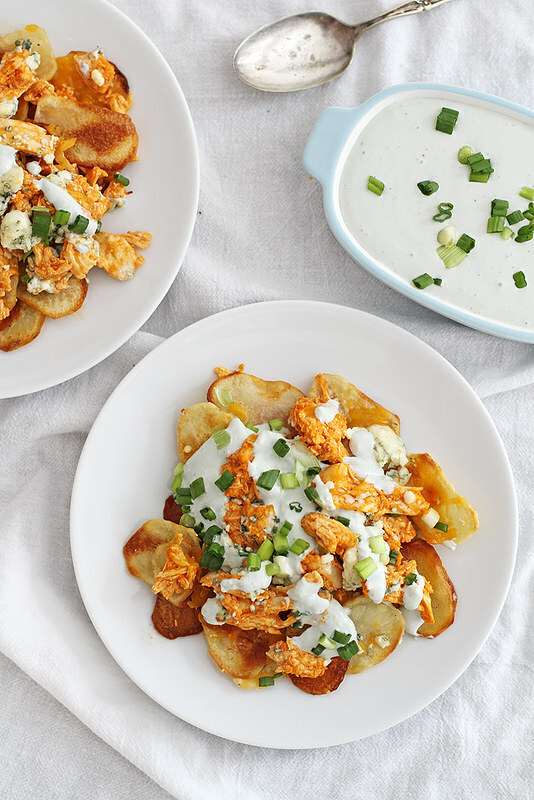 These look like ultimate of ultimate buffo chicken nachos – I love that you made the chips homemade and now all’s I want are nachos dripping with buffalo sauce! Saw these on Instagram and immediately had to come comment!! If these were even within arm’s reach of me, I’m pretty sure I’d devour the entire platter. Mess on a plate or not, this looks so mouthwatering! I want a big plate RIGHT NOW!! These look so good! They would be a big at a party! How fun are these nachos, and what a crowd pleaser! This looks like a real crowd-pleaser… if that crowd was a party of one and that party of one was me… only because I will eat them all and refuse to share 🙂 Love these, Steph! This is like my favorite thing of all time. Spicy chicken plus crunchy carby chips!!! Love it!!! Holy cow! I am so on board with this! Seriously girl potato chips meeting nachos is the most brilliant thing I have seen in a long while! I now know what we’ll be snacking on while my husband watches the games this weekend! These nachos look incredible! This is amazing. Only a culinary genius thinks of something like this and puts it together so well. Delicious!